Stayed September in space 56 in 35' class A with toad. I am moving here and staying forever! Back in site was gravel & level. Huge trees. Private lawn in this space for fur baby. It was quiet and relaxing and I could only stay one night. Bitter much? Did not use the facilities, but I'm sure they were nice. Staff was very helpful when reserving and just as helpful months later when I had to change reserved site due to new MH. 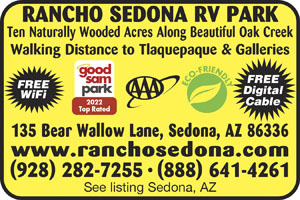 Awesome RV Park! Beautiful shaded sites with lots of room. Exceptionally clean park with crews working all day maintaining All facilities. Forest seclusion yet practically in town. Will definitely stay here again! This Park exceeds its Good Sam Rating! The folks that manage this RV park are great. The park is very well maintained, spots are shady and facilities are clean. Many of the other parks we have stayed at in the recent past do not live up to advertised amenities like cable, wifi, etc. Rancho Sedona exceeded our expectations. We would definitely come back. A great value. We just returned from a trip to the West and stayed in 12 different RV "resorts". This by far was the best one. It's right on the creek that runs through Sedona, is totally shaded by large trees and is quiet. The sites were lovely with yardmen working all day picking up the leaves and mowing the grass. Each site had a cement patio and a private lawn area. We needed 27' for the trailer and another 20' for the truck; the sites were plenty long, too. We stayed only 3 nights and wish we could have stayed longer. They also offered gourmet breakfasts to go at one of the 2 large campfire/ cook-out grassy areas within the RV park. We didn't partake, but it looked good. 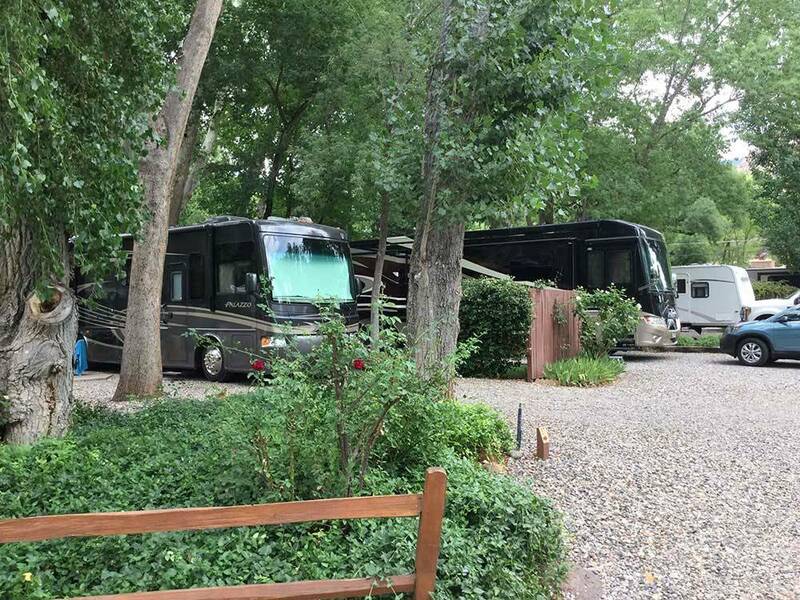 We are relatively new to travel trailer parks, so we don't have a lot with which to compare this park. We found the park to be clean and well maintained. The roadways and access were very good. We are a retired couple, so we aren't parties, but felt a little intimidated by the rules, particularly having to be in our trailer by 10 PM and not to go outside before 7 AM. No star gazing here! Also felt the personnel we dealt with in the office were VERY all business rather than the good natured people we have found in the other parks we have been to. Just a personality difference we weren't use to. We would return, but may also see if there are other options in the area. “Fantastic location, excellent facility, well maintained and managed” 5 Stars from us. We don't need a pool. Excellent hookups, clean power, and attentive staff when wanted. We also do use WiFi, and experienced vastly improved speed and reliability upon an upgrade that took place while here. Our experience here has been stellar, and do not agree with opinions of some reviewers who don't like rules. The rules are not excessive, but enable enjoyment for all who stay. We will be back on a regular basis. Good Sam and AAA discount is nice. Nice place to walk our dog, and walk to town and retail nirvana. Red Rock trails and creekside trails accessible from the RV park. Just awesome! We stayed here for a week in June, bottom line one of the nicest parks we have stayed in. I would recommend a stay here for anyone visiting Sedona. 5 minutes from town and feels like you are in the country. There is a nice babbling brook that borders the park. Very Quiet and peaceful except when the Heron babies nesting in the trees got hungry, they were very loud, fortunately it only lasted for a little while and they were quiet at night. The sites are well maintained and level, hookups were a breeze, lots of (HUGE) shade trees, plenty of parking. They have a few rules and they enforce them but, it is all for the good of the park. Staff was very friendly and helpful. The park was a little higher priced than some but in this case well worth it. We will be back. From Jct of I-17 & SR-179, N 14 mi on SR-179 to Schnebly Hill Rd, NE 0.25 mi (at 9th Roundabout), NE 0.25 mi (L) Note: Hwy 89A not advised from the north.